Asparagus...love them?? or leave them? I was reading Cathy's blog, Wives With Knives..(don't worry, she's a lovely, non violent lady in spite of the title..:), and we were talking about asparagus. Then I read in the gardening column of our local paper that they take 3 years to produce a harvest, but that they will grow and produce for years and years. I don't know about that here, the deer eat my vegetables, wipe them out in one night! The farm is nearby. I should just accept defeat! Last summer I had some cherry tomatoes that escaped the deer. I told my 4 yo grandson we could go pick them. He immediately ran into the house to get something to collect the harvest ....an 8 qt pot! A teacup would have been big enough! 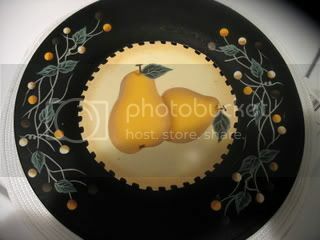 Kathleen, what a gorgeous wooden charger and those placemats and napkins are some of my favorites. 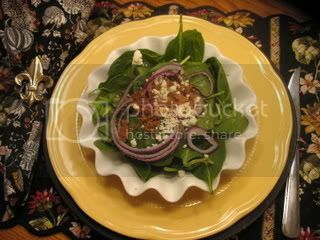 Dinner looks delicious, but I really love the salad ...spinach, feta and bacon AND red onion. Yum, yum. I knew you had deer but had forgotten how much damage they did. We see deer occasionally, but they just bound back and forth over the fence ... not sure what that's about. I could eat asparagus every day and never get tired of it!!! Here we just drive the country roads on an asparagus hunt..grows wild all over! Your tablesetting is so cheery and pretty..that always makes the meal better. Your loin looks perfect, everything stepped up a notch, love it! I bought asparagus this evening! Thanks for the little lesson and quiz. I planted some last year that were supposed to be 2 year plants, so theoretically I should be able to harvest this spring. I will definitely keep you posted on that. They were the size of tooth pics this year! Love your black and yellow. The charger is gorgeous. Hmmm..just popping by..everything looks so good Kathleen. I can recommend potato planting for the wee ones..Just a few..
Oh, Kathleen, your table setting is beautiful. I love the black and yellow. We don't have Home Goods here, is it like TJM? The black charger is a knockout. 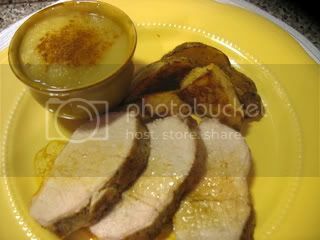 That salad looks delicious as does the Pork Roast...Love the charger. As for my Vegetable garden...DH made me a nice little area, with 7 ft fencing, and a lovely gate. That seems to work. I wish I could do that with the rest of the property! You know my woes with deer. We counted 7 on our property last week. Seems my flowers and shrubs are their salad! The black and yellow are beautiful together, Kathleen! What a gorgeous charger too. Asparagus is on our menu as well as pork roast this week. What kind of sauce did you put on the pork? Hi Kathleen. I was sure I had already commented to you... it must have disappeared with my earlier Tom Selleck comment! Anyhoo... I love asparagus, DH does not. I rarely make it just for myself... why didn't you invite me for dinner? 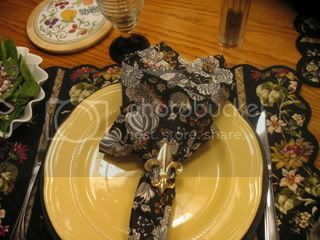 ;-) Pretty tablesetting... yellow, so cheerful! As always, dinner looks delish.